The ICE Futures canola platform finished the day stronger, supported by a weak Canadian dollar. Trading was choppy in the last few minutes before market close. The Canadian dollar fell below the 75 U.S. cents mark Monday, as tensions continue to rise over the arrest of Huawei Chief Financial Officer Meng Wanzhou last week. China has warned Canada it could face severe consequences for the arrest. Canola contracts found support from tightening spreads as participants are starting to roll their January positions forward into March. Spreads accounted for most of trade during the day. Chicago Board of Trade (CBOT) soybean and meal contracts were weaker, while soyoil contracts were stronger. The United States Department of Agriculture (USDA) releases its monthly supply/demand report tomorrow, and pre-report positioning took place during the day in North American grain and oilseed markets. About 32,757 canola contracts traded, which compares with Friday when 29,759 contracts changed hands. Spreading accounted for 26,924 of the contracts traded. The USDA announced a 125,000 tonne sale of soybeans to unknown destinations for the 2018/19 crop year this morning. Bloomberg reported that China will soon announce it will be resuming U.S. soybean purchases. Volume could be in the five to eight million tonne range, but it is still being decided as to whether or not they will lift 25 per cent tariff. China imported 5.38 million tonnes of soybeans in November, according to the USDA. This is down 38 per cent from last year; it is the smallest monthly volume in two years and the smallest November volume since 2012. Year-to-date imports are down by four per cent. CBOT corn prices finished the day in the red. The USDA announced a flash sale of 1,645,920 tonnes of corn to Mexico this morning. This is the fourth-largest daily sale of corn on record since 1977. Wheat futures in the U.S. finished the day weaker. Winter wheat acres in Kansas are expected to be less than last year, due to a colder and wetter than average fall. This could see Kansas having the smallest wheat acreage number in more than a century. Export prices of Russian milling wheat rose by US$3 per tonne last week to US$228 per tonne, following another sale to Egypt. Light crude oil nearby futures in New York was down $1.61 at US$51.00 per barrel. In the afternoon, the Canadian dollar was trading around US74.74 cents, up from 75.19 cents the previous trading day. The U.S. dollar was C$1.3379. The annual Canola Expo held in Langdon at the Langdon Activity Center was once again highly attended and provided a great day of learning and spreading of information on exciting projects. The show, sponsored by the Northern Canola Growers Association, is in its 21st year and closed out another record-breaking year of canola production in the state of North Dakota. Across the United States, the 2018 growing season saw a total of 3.6 billion pounds of canola harvested. North Dakota brought in the lion’s share of the harvest with 2.9 billion pounds. Planted acres of canola did not change from the 2017 growing season with 1.56 million acres being planted in 2018, but those acres saw a nearly 300 pound per acre increase as the 2018 harvest yielded 1,920 pounds per acre in North Dakota. Canola, as a crop, had an outstanding year, but 2019 may prove more difficult for producers to have a successful year, especially those in Cavalier County. From volatile market forecasts to a pathogen outbreak, 2019 will be filled with many challenges for producers to navigate and come out unscathed. The canola expo began with Dr. Lesley Lubenow informing those in attendance that clubroot of canola, a pathogen on a rampage, is increasing its root hold in Cavalier County. Dr. Venkat Chapara, soil pathologist at the Langdon Research Extension Center, saw substantial increases in clubroot infected fields across the eastern portion of Cavalier County. The moisture loving and low pH tolerant pathogen has started conversations on how best to combat the disease. Dr. Lubenow and Dr. Chapara gave the following recommendations- increase crop rotation to at least 3 years and begin planting the resistant varieties. Dr. Chapara has been conducting research in attempts to determine if there is anything more that producers can do to limit the impact the pathogen can have on susceptible crops. One of his studies found that raising the pH of the soil through the amendment of beet lime decreased the impact that the pathogen spores had on the canola roots. However, this alone cannot stop the spores as there is no effective chemical control and limited resistant varieties for producers to plant. “Rotating the resistant varieties is vital. Genetics are a tool, but there is a no eradication [of clubroot]. We have to learn to live with it,” Dr. Lubenow stated. Dr. Louis del Rio followed Dr. Lubenow and reiterated the dangers that clubroot poses. Of the diseases that affect canola, clubroot is by far the most damaging with little to no way to control or combat its effects on plants. “The moment we need to take for planting resistant varieties and extending rotation is now,” Dr. del Rio stated. Other diseases, such as black leg, appeared to have decreased in field surveys conducted across the state this year. End of season field surveys for insects resulted in 100 percent identification for crucifer flea beetles in the fields surveyed while only 66 percent of fields surveyed had striped flea beetles. Other insects that were identified include the cabbage flea beetle, the flea beetle, and the three-spotted flea beetle. These last insects were only at very low levels in the fields surveyed. The keynote speaker for this year’s canola expo was Randy Martinson of Martinson Ag Risk Management group based in Fargo. Martinson, unfortunately, did not have much better news to give to the producers in attendance as many of the crops discussed were in upheaval as a result of the trade war and would not see stabilization until a deal is finalized between the United States and China. Martinson went over numerous issues that will affect crop production in the area including oil prices and production, as well as planting and harvesting conditions around the world. 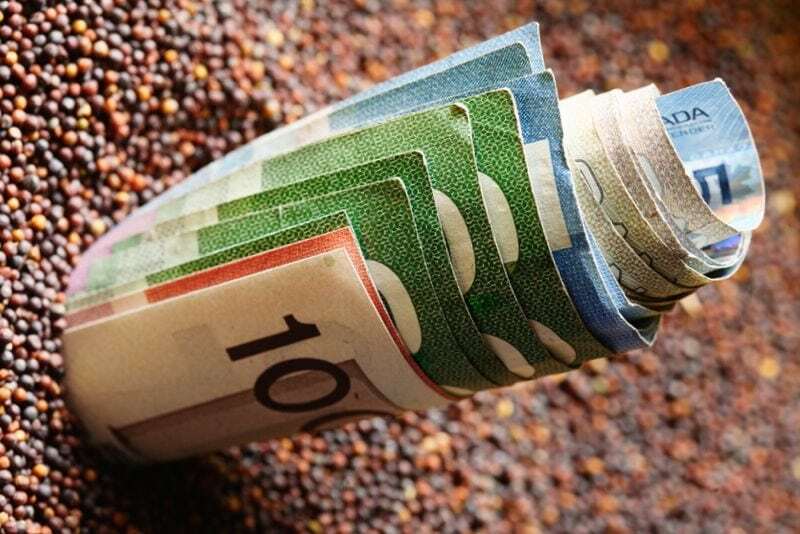 Canola prices are linked closely to soybeans, and while there has been good news in terms of the U.S. – China trade war with a truce being reached, it will not take full effect until January 1, 2019. Even then, Martinson still was cautious as there is a three month window for things to change. “Three months to come together and get an understanding. A trade deal can’t be made in 90 days,” he said. The start date of January 1 poses the problem of trying to get any American soybeans into China before the Brazilian harvest begins. Due to excellent planting conditions, some Brazilian provinces planted exceptionally early and are slated for a late December harvest. This poses a problem for the stock-piled American soybeans looking for a market. For American farmers, the end of the 90 day window falls on April 1, long after producers will have made planting decisions for the 2019 growing season. One bright spot is that the NAFTA 2.0 deal has been finalized bringing two of America’s biggest trading partners, Canada and Mexico, back into play. Martinson also believes that once soybeans start to see a positive upturn, canola will follow. For Cavalier County, the other big crop of wheat will be the most positive despite a national decrease in acreage. But just like with soybeans and canola, wheat cannot expect to see a positive turn until after the first of the year. Overall, Martinson advised producers to watch the prices, and when they hit the break even mark, it would be a good idea to sell. The producers will know when that time arrives as the Chinese must first lift the tariffs off American goods before they will begin to purchase.